Cedric Benson dressed in shells and was a limited participant in Monday’s practice, but he won’t play in Thursday’s preseason home opener against the Browns, and that’s causing Mike McCarthy to continue feeling the pinch at running back. Benson spent the majority of practice watching Kuhn, Green and rookie Marc Tyler share reps. James Starks (toe) and Brandon Saine (hamstring) stood off to the side. Green, of course, is less than a year removed from knee reconstruction. Injuries have created a desperate situation at running back for the Packers, and Benson was signed on Sunday to help ease the crunch. He’s rushed for more than a thousand yards in each of the last three seasons, but he’s more of a runner than he is a receiver and a pass-blocker, which has caused some to question Benson as a fit in the Packers offense. McCarthy cited the Packers’ transition to a one-back type of offense as being an especially good fit for Benson. 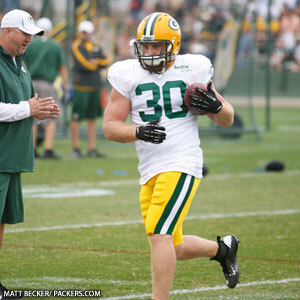 Injuries are causing practice targets difficult for McCarthy to reach. It would seem to be his greatest concern as training camp heads into its latter stages. “We’re not where we wanted to be. Today’s practice was supposed to be (two hours, 21 minutes long). When John went down, I didn’t think it was worth the risk to try to get through the last period,” McCarthy said. Benson will be a welcomed addition to the backfield after he completes the initiation processes and is cleared for full participation. In other injury news, tackle Marshall Newhouse and wide receiver Tori Gurley returned to practice on Monday. Gurley turned in one of the highlight plays of practice when he bowled over cornerback Dion Turner following a reception. Defensive lineman Ryan Pickett and safety M.D. Jennings were excused from practice due to personal reasons. Jermichael Finley continues to be sidelined by a quad injury. For more on new RB Cedric Benson, who spoke with reporters in the locker room on Monday, click here.